What Percent of Your Marketing Budget Should You Spend on Content Creation? Content marketing has quickly surfaced as one of the most important digital marketing strategies, so what should that mean for your company’s marketing budget? Since every company is different and wields a unique marketing approach, there is no definitive answer. That said, content creation should never be an afterthought. If anything, its growing importance means businesses that fail to budget for content creation will lag behind. Content creation has become the most critical method for generating organic search traffic and engaging inbound audiences. Other digital marketing channels like email and paid display also tend to have high-quality content intertwined within their strategy. Even when using outbound advertising in combination with landing pages, content often provides a lead magnet or an excuse for a prospect to spend more time on the site, nurturing them further. All of these strengths have spurred B2B and SaaS companies to invest more in content creation this year than ever before. Learn about how much typical companies spend, advice for allocating your own content creation budget, and general tips on content strategy by reading on. According to a wonderful infographic created by Express Writers, marketers will create more content in 2017 than any year before. 70% of marketers plan to create more content in 2017 than last year, and 39% expect their budget to increase. The reasons behind these budget increases are clear. Firstly, online audiences are consuming more content. Video content consumption in particular has swelled to become 74% of all internet traffic, and branded videos have increasingly popped up alongside the most successful content creators. By collaborating with influencers and upping the ante on their production values, certain brands are reaping the benefits of increased views and better inbound lead generation. Google also indexes more pages as search engine traffic grows. Companies without a sufficient content marketing budget may see themselves lagging behind in critical keyword rankings as a larger number of competitors enters the scene with more content pages than ever before. How Much Are Companies Spending on Content in 2017? 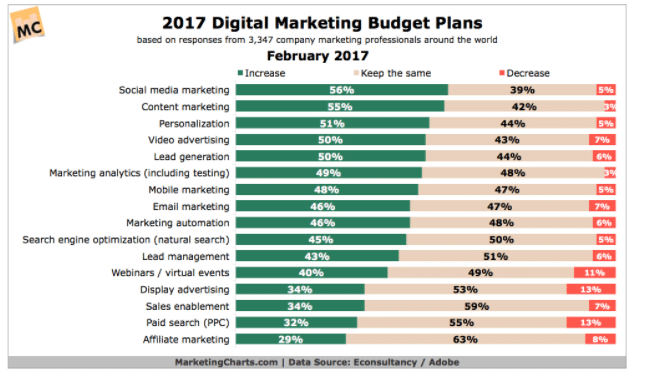 While most content marketing budgets are increasing or staying flat (just 2% of B2B marketers say they’re decreasing), not every company spends the same portion. The average business-facing company (B2B) spends 29% of their overall marketing budget on content-related projects. This number may be a bit deceptive, though, because spending within these companies lands all over the map. 22% of surveyed companies allocate just a slim margin of their budget — less than 10% — to content creation, for instance. Yet, this low number does not reveal the whole story. When looking at companies that report a high level of success with their content marketing programs, they allocate a higher portion of their budget to content creation than average. Those with the highest degree of success allocate 39% of their budget, on average, whereas those who find the least success allocate only 22%. Furthermore, 37% of those surveyed who had stagnating content marketing success blame budgetary constraints, while a quarter of companies claiming increased content marketing performance credit having a bigger budget. So, while budgets within the industry fluctuate, a clear pattern emerges correlating successful marketing with giving content creation a bigger portion of the budget. Audiences seem to agree with this strategy that more content and higher-quality content is the better option. Long-form blog posts generate nine times more leads than shorter blogs, and 70% of people in general prefer to use content to get to know a company over paid advertisements. Based on the information above, B2B organizations have a wide range of possibilities when allocating their content budget, but those who turn over a larger share tend to find greater success. If 29% – 39% of your digital marketing budget sounds like a large chunk, consider that content marketing involves more than just the creation of content itself. In fact, creation of short-form content typically commands a much lower cost than other marketing activities. But other content marketing activities deserve your attention and budgeting, too, since they amplify the returns obtained from content creation. Strategizing and research — Your team should meet regularly to discuss content marketing goals, overarching strategy and metrics used to quantify success. 81% of the top B2B content marketing performers have a clear definition of success. Content promotion — Finalizing content assets is just part of their journey. The typical B2B company distributes and promotes content on an average of six different channels. Content creation and support tools — Keyword research, SEO analysis tools, marketing automation tools, CMSes and scheduling tools all cost money to operate but typically generate efficiencies that free up the team’s time for more productive activities. Prioritizing a mix of content quality — Long-form content, pre-produced video content, white papers, infographics and other forms of higher-quality content provide effective assets and enhance the effectiveness of cheaper and easier-to-produce short form content. Measuring and optimizing content — Obtaining the highest ROI requires you to constantly and consistently monitor content while making optimization changes to improve performance and guiding future strategy. In the end, your business has the final say on how much it wants to spend on content creation. However, it should recognize the clear trends outlined above. Content marketing has become more important than ever, and supporting it with an adequate budget increases the chances of success. Ultimately, content marketing offers some of the best ROI for businesses of all sizes, and SaaS companies in particular benefit from a large quantity of educational, value-add content. Try to dedicate at least more than 10% of your budget to the cause of creating outstanding content people want to read. Include room for necessary strategizing, promotion and supportive activities to help drive content success, as well. 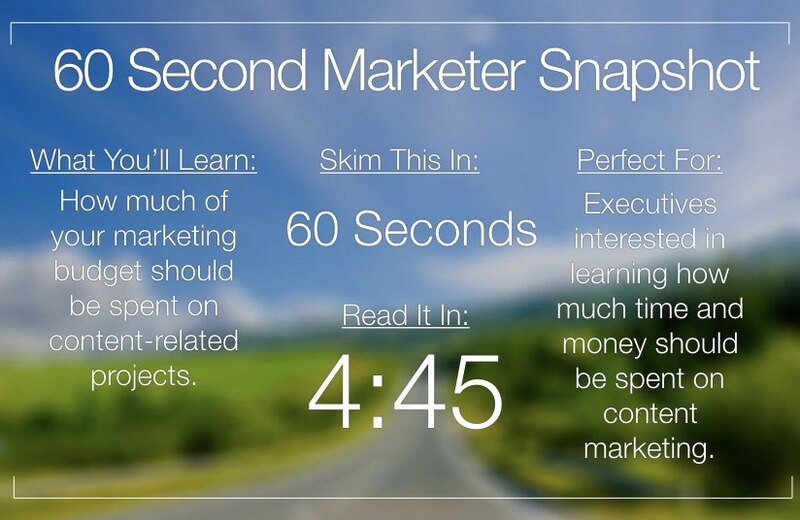 The more you invest in content marketing, the more you get out of it. So, research your own company’s possibilities for creating more content, and do not shy away from dedicating adequate resources to what is quickly becoming one of the most important competitive differentiators of our time. About the Author: Nick Sawinyh is a proud father, husband, and corgi-owner. I’ve been working in SEO Industry for more than ten years. I love finding new trends that affect technologies that impacts the world of telecommunications and web. Product Manager at Seomator.